His chance came when an assembly line at a Cheeto plant broke down right before the curls could be covered in cheese dust. Montañez grabbed some of the un-oranged Cheetos and took them home to experiment. He eventually became inspired when he watched a food vendor in his neighborhood making elote, a grilled Mexican street corn coated with cheese, butter, lime and chile powder. Montañez applied the same idea to Cheetos, creating a snack that his friends and family loved. Remembering the message from the video, he decided to give the CEO a call about his concept. Enrico accepted the call and gave Montañez two weeks to develop a pitch. He prepared by creating a strategy he learned from a marketing textbook and by purchasing a $3 tie, his first ever. 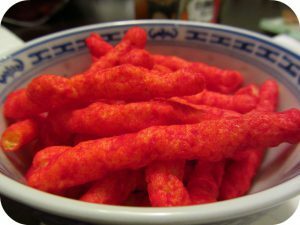 Incredibly, Enrico loved his spicy take on the snack, and thus the Flamin’ Hot Cheeto was born. Montañez has since worked in various positions at Frito-Lay, including executive vice president. How did the Frito Lay CEO’s message motivate Montañez to develop his idea? Do you think this motivational strategy would work at other companies? Why is it important for companies to seek out new ideas from a variety of potential sources? Source: Travis M. Andrews, “The Flamin’ Hot Cheetos Movie: How a Frito-Lay Janitor Created One of America’s Most Popular Snacks,” The Washington Post, February 23, 2018. Photo by Calgary Reviews.